From the north, exit Wilshire East; or from the south, exit Wilshire Westwood. At the third traffic light, turn left on Westwood Blvd. Proceed across Le Conte Avenue and at the next light, Medical Plaza Drive, turn left and follow the ramp down to the parking lot below. 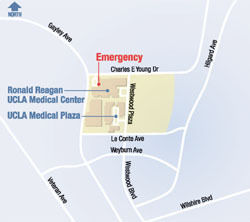 Additional entrance is found north of Le Conte Avenue on Gayley Avenue, two blocks west of Westwood Plaza. Take the San Diego Freeway northbound to Wilshire Boulevard east, and continue as described above. Rate: $12 - pay on exit at a Pay Station (located near the parking elevators) prior to returning to your vehicle.